In Saleforce.com you have two types of storage – File and Data. File storage includes attachments, items you’ve upload into the Documents tab, and Salesforce CRM Content. Everything else, including activities, is considered a record and counts towards your Data Storage allocation. A record in Salesforce.com uses about 2K of storage. So, 250K records = ~ .5GB of storage (for context, Enterprise Edition comes with 1GB of data storage). Last I checked on the price of data storage (1/4/2010), an additional 500MB of Data storage was running $125 / mo while File Storage was running $5 / mo for 1 GB. That gives you an idea of the premium you’re paying for managed storeage in the cloud. Data storage is 25 times more expensive than File Storage! Depending on your business, it is absolutely possible to spend more on data storage than licensing annually. I’m managing an org today that has requires over $10K annually in additional storage. Is storage in Salesforce expensive? At face value it would appear so, but let’s realize this is managed storage. A Salesforce org runs just as fast with 1,000 records as one with 10 million records. That’s the beauty of Salesforce.com’s multi-tenant architecture – you never have to keep an eye on your data center to figure out if your server needs more RAM or if you need to migrate your database to a faster box. Salesforce grows with you – seamlessly. 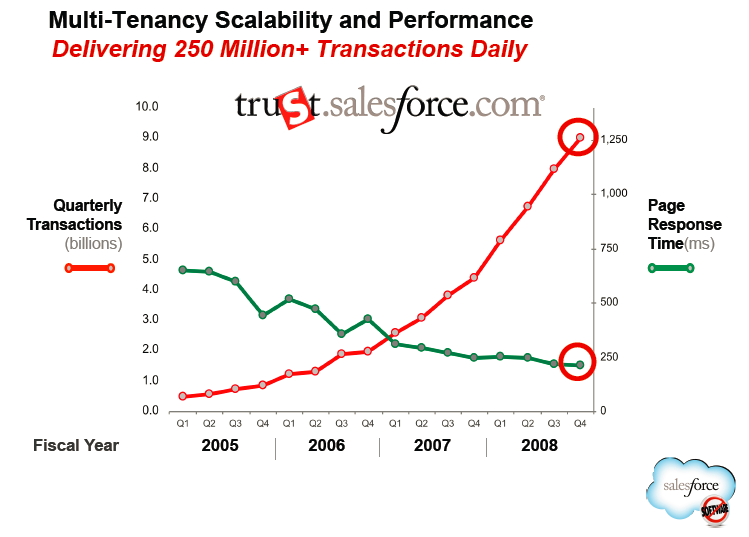 In fact, as Salesforce has grown over the years, their data centers are actually running faster! If storage costs are a concern, decide what data really needs to be in the cloud. Many companies have a Data Warehouse with all their transactional data. Does ALL this information really need to be in Salesforce as managed data? Can the data be summarized in any way before being imported? For example, can you take data in four tables and collapse it into one table? If so, you’ve reduced the number of records being created in Salesforce four fold. If you find that your data is growing at an alarming rate, then one strategy that I have used with great success is to build a “cleanup” routine to purge really old records, or have the routine archive old records where data storage is cheaper – like a local server. For example, do you need shipping confirmation records on completed orders older than a year? Bottom line do some planning upfront with your record storage, but rest easy in knowing that Salesforce will grow with your business with no impact in performance. This entry was posted in Data. Bookmark the permalink.